The freedom to study the work and apply the information: The licensee must be allowed to examine the work and to use the knowledge gained from the work in any way. The license may not, for example, restrict "reverse engineering." You must release derivative works under an identical or similar license. 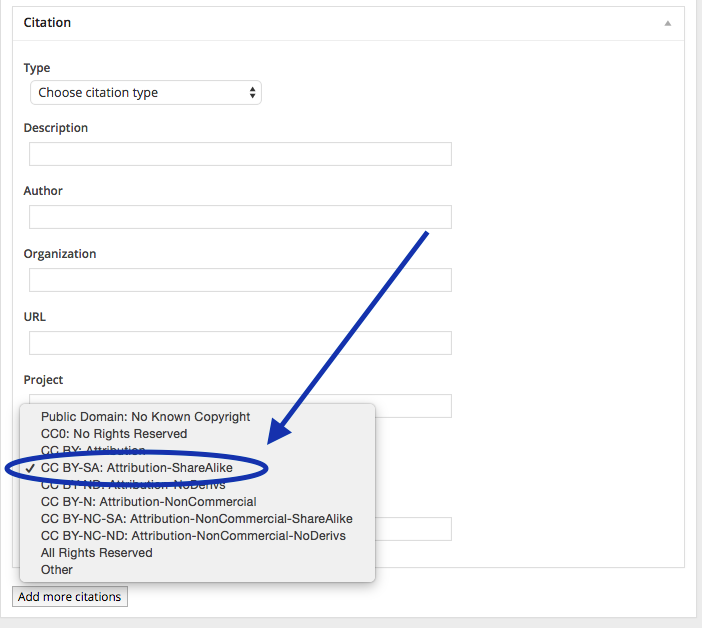 In other words, if you use material that has a Share-Alike license, you must publish whatever you do with it, and publish it under an SA license as well. OER material with a CC BY-SA license allows you to apply any of the 5R's (reuse, revise, remix, redistribute, and retain) to it. You can copy & paste it straight into Lumen texts; you can adapt it; or you can remix it with other CC sources (except CC ND). Note that CC BY-SA is sometimes combined with other Creative Commons Licenses. All of the combined licenses must be respected when using these sources in your book. If you revise or remix SA content, you must publish your adaptations with an SA license, as well. 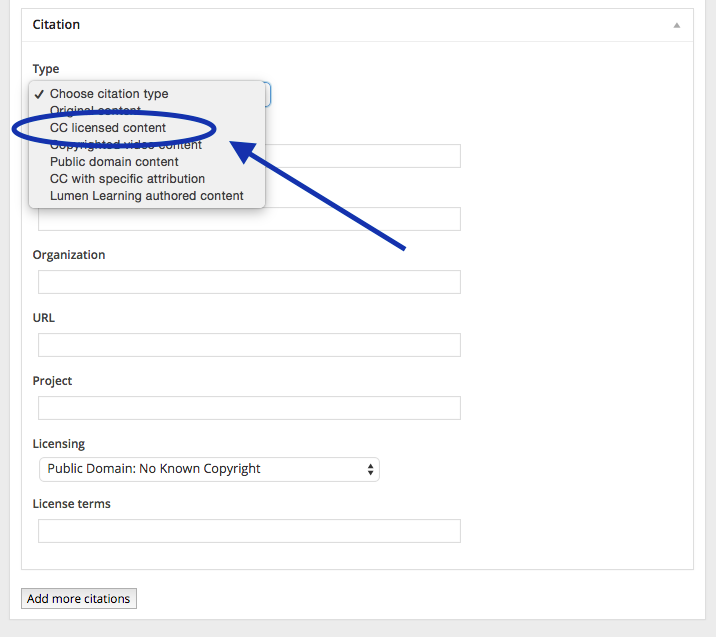 In the "Citations" portion of your Edit Page, beneath the text editor box, select "CC Licensed Content." Add as much information about the Description of the Content, the Author, the Organization, the URL, and the Project as you have available. Under the "Licensing" pull-down menu, select "CC BY-SA: Attribution-Share Alike." Click Update on the right to Save the page (or "Publish" if the page hasn't yet been published). If you create material in your Lumen book that you'd like to license as CC BY-SA, you can use the same tools to cite it as noted above. Use the "Description" and "Author" fields in the Citation section to give yourself credit for this work. Including your "Organization" (such as school name) and/or the URL for your institution will be helpful if others want to contact you about this work later on. If you opt to apply SA to your own work, you are requiring that anyone who uses it, who wishes to share it, must also publish what they do with it under a CC BY-SA license.